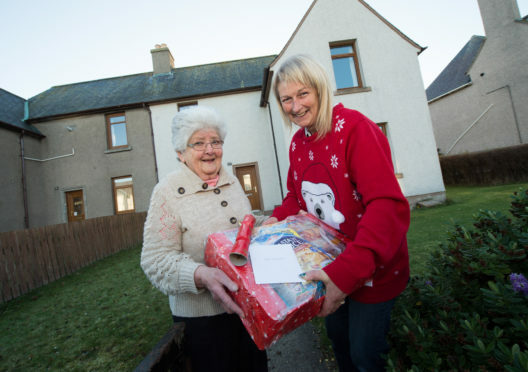 Pictures show Land lady, Lynn Mitchell of The Brander Arms in Lossiemouth with her food parcels and delivering the parcels to an older lady in Lossiemouth. In the bar you can see all of the donation envelopes. Picture: Lyn Mitchell (right) and (left) Helen Donaldson. The landlady of a Moray pub decided to spread some festive cheer this Christmas by creating over 100 hampers to hand out to local pensioners. Lynn Mitchell who runs the Brander Arms in Lossiemouth came up with the idea a few years ago to ask for food and cash donations from her regulars so that they can give back to the local community. It started out as a campaign for a children’s charity but then developed into a scheme to help out potentially lonely older people in the coastal town. This is the third year Mrs Mitchell and her assorted volunteers have been handing out food hampers to single pensioners in Lossiemouth and it has been their most successful one yet. The pub collected £2,020 plus food donations from regular visitors and created 101 hampers to give out – 21 more than last year. Mrs Mitchell believes that it is only right for the pub to give back to their local community. She said: “We started making these hampers a few years ago and originally did it for Cash for Kids but then decided to help out single pensioners who have no-one else over the festive period. “The recipients are chosen through mostly nominations from local people in the pub or ladies who do caring in Lossiemouth. The hampers include a wide range of non-perishable food items including breakfast cereals, sugar and biscuits with each hamper having exactly the same things in them. Mrs Mitchell, her husband Alan, her family and some volunteers handed out the parcels yesterday. Lossiemouth Community Council vice-chairwoman Carolle Ralph praised Lynn and her family for her work. She said: “I think it is a wonderful and appropriate example of generosity and spirit at a busy time of year.